After I had heard that RS-40 was successfully launched, it was obviously that we where going to try and receive the signals from this new satellite. The first attempt failed because the satellite wasn’t in range of its groundstation. This attempt was made on 28-Juli-2012 in the beginning of the evening. 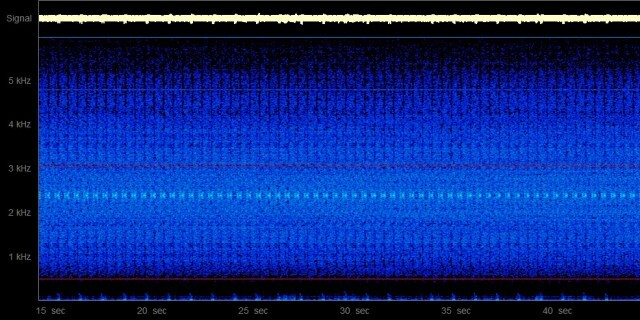 Today 29-Juli-2012 we tryed again during the pass of 12:30 UTC and recorded some fine signals. I used the data that belongs to Object D. The signal strength varies from 7 to 9 20 db. Switching between RHCP and LHCP can improve the signal strenght with multiple db’s. The first signals, switch between the two downlink frequencies, when the signals stop on 435.265.000 MHz FM they start again on 435.365.000 MHz FM. 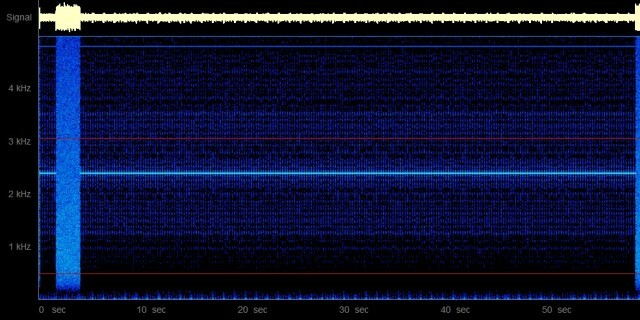 After about six minuts the patern changed and there where only signals on 435.365.000 MHz FM. 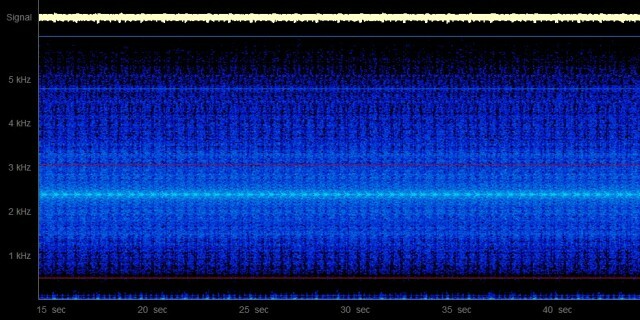 When you listen close there is a difference between the pattern from the first recording and the second. Something that can’t be seen after the recording, is the fact that the signals of the first pattern have a higher bandwidth, and therefore likely to have a higher baud rate. Doppler shift measurements show that RS 40 (alias Yubileiny 2, alias MiR) is object 38735 (2012-041C). This is now also confirmed by Space-Track. Thanks PA0DLO for this update in the Amsat-NA mailing list. If there are people that can give me some extra information regarding this new satellite, please send me an email via the contact page. Information about the team that built the satellite, the ground and decoding software is very welcome. A Russian Rockot Launch Vehicle blasted off from Pad 133/3 at the Plesetsk Cosmodrome at 1:35 GMT on Saturday, July 28 on a mission to deliver four payloads to Low Earth Orbit. All payloads were delivered to their intended orbits and the mission was declared a success by officials. On this flight, three Gonets-M Communication Satellites, the MiR technical demonstration satellite and the Rodnik Satellite for the Ukranian Military Satellite was deployed to Orbit. This launch marked the Return-To-Flight Mission for the Rockot Launcher that suffered a failure on its previous mission on February 1, 2011 when the Upper Stage of the launcher encountered a malfunction, placing the Payloads in a lower-than-planned Orbit. After the failure, the manufacturer of the Launcher and Upper Stage, the Khrunichev State Research and Production Space Center, suspended Rockot Launches to investigate the cause of the premature shutdown of the Briz-KM Upper Stage. After the cause of the failure was found, Rocket was approved for flight once again. During final preparations for the Return To Flight Launch, a problem with the BrizKM Upper Stage was found and the mission was delayed by three weeks in early July to give teams sufficient time to repair the electronics of the Upper Stage and fix a wiring issue. Launch occurred on time on July 28 and the Rockot launcher blasted off as expected. Rockot is a two-stage liquid-fueled launch vehicle, usually equipped with a Briz-KM Upper Stage, that is capable of delivering payloads of up to 2,140 Kilograms to Low Earth Orbit and 1,200 Kilograms of Payloads to Sun-Synchronous Orbit. The vehicle stands 29.15 meters tall and has a main diameter of 2.5 meters. Rockot has a launch mass of 107,000 Kilograms and uses Unsymmetrical Dimethylhydrazine and Nitrogen Tetroxide as Propellants. The first stage of the Launcher is 17.2 meters long and is powered by three RD-0233 Engines and one RD-0234 Engine with a total liftoff thrust of 1,870 Kilonewtons. The first stage burns for 122 seconds before being separated. The second stage of the Rockot Launcher is 3.9 meters in length and uses a 240-Kilonewton RD-0235 Engine for propulsion. The second stage also has four vernier thrusters each providing 16 Kilonewtons of thrust. Second Stage Burn time is 183 seconds. The Briz-M Upper Stage of the vehicle can be ignited multiple times featuring missions with coast phases to reach a variety of orbits. Also, Briz-M provides precise injection capabilities. The Upper Stage is powered by an S5.98 Engine which can burn for up to 1,000 seconds, Actual Briz-KM performance depends on the Mission Profile. The vehicle has a dry mass of 1,320 Kilograms and includes avionics, thermal control systems (active and passive) as well as payload accommodations. Briz-KM carries 3,310 Kilograms of N2O4 Oxidizer and 1,665 Kilograms of UDMH Fuel. 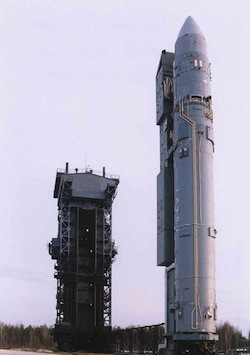 The two stages of the Launcher performed as planned and the Upper Composite of the Vehicle consisting of the Briz-KM and the four payloads, was separated. The Briz-KM made its first burn to place the stack in a Low Earth Parking Orbit before making multiple burns to achieve an altitude of about 1,400 Kilometers and an inclination of 82.6 degrees to deliver its payloads to their desired Orbits at 3:19 GMT. Gonets M Satellites are Russian Communications Satellites. A number of Gonets Satellites are part of the constellation that is operating in Low Earth Orbit at an altitude of about 1,400 Kilometers circling Earth in high-inclination orbits. Gonets M are operated by the Gonets SatCom telecommunications company that provides communication services for a number of users and applications. Gonets satellites are used by industries and governments for different purposes including asset management, tracking of moving and fixed objects, environmental monitoring, meteorology and control of electric grid, oil-wells and pipe-lines. Also, the Gonets Satellite fleet can be used to provide communications to remote, disaster-stricken or isolated locations. 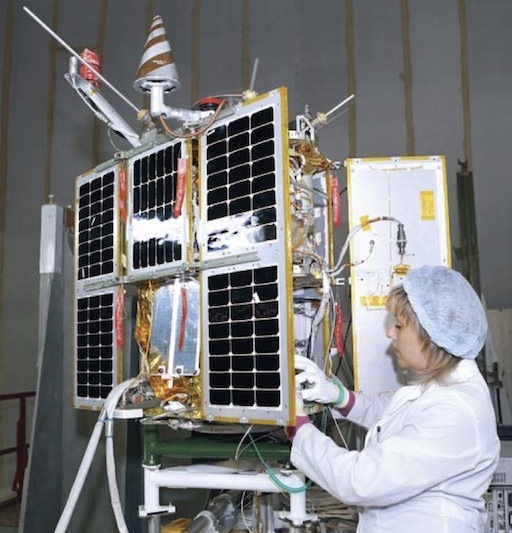 The first Gonets Satellite was orbited in 1993 with the first operational vehicle entering service in 1996. Current Gonets Spacecraft, designated Gonets D1M have a launch mass of 280 Kilograms and provide 16 channels for uplink and 16 for downlink. Data transmission of rates of up to 64Kb/sec are supported in frequency ranges of 260MHz and 312-390MHz. The Spacecraft are equipped with Solar Arrays providing 40W of electrical power and Nickel/Hydrogen Batteries. The expected on-orbit life time of a Gonets Spacecraft is 7 years. Gonets stands for ‘Messenger’. MiR, also called Yubileiny-2, is a Russian technology development/demonstration Satellite. The vehicle is a small spacecraft testing radio equipment in a space environment. MiR carries payloads developed by researchers and students. The fourth Payload for this flight is the Rodnik Spacecraft which will become a part of the Strela Constellation of Ukrainian military communications satellites. Strela Satellites are based on the civilian Gonets Communications Satellites. The Rodnik Satellites are believed to be an improved version of the Strela-3 Spacecraft that have been launched from 1985 to 2010. Gonets and Strela Satellites are built by NPO Prikladnoi Mekhaniki. This flight marked the 19th mission of the Rocket Launcher and was its 17th success. With this successful Return to Flight Mission, Rockot won’t have to wait too long for its next mission. 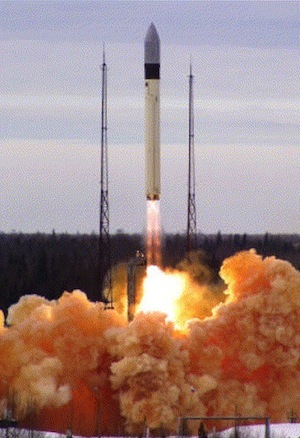 Another Rockot Launch from Plesetsk is planned on September 14, 2012 to deliver three Kosmos Satellites to Orbit. On November 13, Commercial Rockot Operator, Eurockot, will launch a Rockot Vehicle with three Swarm Satellites. The small spacecraft MiR (Yubileiny-2) is one of them. The satellite was named after Mikhail Reshetnev, the founder and the first director of the company. The previous satellite for scientific purposes – Yubileiny – was placed into orbit in 2008 and since then it has exceeded the designed lifespan by three times and now is still carrying out its mission. ISS-Reshetnev has recently completed MiR, and the satellite is to be inserted into LEO with the next launch of a Rockot vehicle. Academician M.F. Reshetnev Information Satellite Systems constantly develops new solutions for space technologies. The small spacecraft MiR (Yubileiny-2) is one of them. The satellite was named after Mikhail Reshetnev, the founder and the first director of the company. 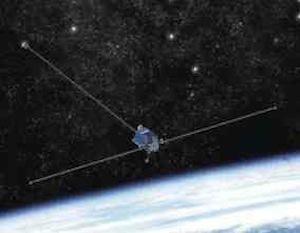 The previous satellite for scientific purposes – Yubileiny – was placed into orbit in 2008 and since then it has exceeded the designed lifespan by three times and now is still carrying out its mission. ISS-Reshetnev has recently completed MiR, and the satellite is to be inserted into LEO with the next launch of a Rockot vehicle. The research satellite MiR enables testing new advanced technological solutions introduced by ISS‐Reshetnev and a number of its associate companies. In particular, MiR is to be used for effectiveness verification of the following structures and components: contoured heat pipes, new technological enhancements for onboard radio equipment and small‐sized sensitive, high‐precision elements of AOCS (including small‐sized magnetic torquers for satellites’ AOCS). These tests would contribute to the further technological enhancement and development of satellites yet to be designed. A number of experimental instruments for the MiR satellite have been manufactured with the participation of students and research members from Siberian State Aerospace University (SibSAU). The company closely collaborates with this university, allowing students to be involved in the process of satellite production. The research and education center “Space systems and technologies” held by ISS and SibSAU, and joint activities under the MiR project provide extensive training and hand‐on experience for talented young people, who in near future might work for the Reshetnev Company. Some instruments designed and pro‐ duced in tandem with SibSAU are used for testing the remote earth sensing technology, in particular, it is a camera intended for observing the earth sur‐ face. Nowadays ISS‐Reshetnev pays great attention to developing the re‐ mote sensing technology. The payload also includes a small WeB‐camera – an important in‐ strument enabling ISS specialists to continuously observe the satellite’s deployment mechanisms and moni‐ tor the performance of satellite com‐ ponents, structures and instruments made of advanced composite materials. In‐orbit performance data will be ana‐ lyzed and referred to in the manufac‐ ture of next‐generation satellites. The new satellite is also tasked with testing the optical properties of solar concentrators, using an experimental solar panel module. In addition to this, a compact navigation receiver installed in MiR (intended to obtain the spacecraft’s orbit parameters using the GLONASS and GPS technology) will also undergo flight tests. The MiR satellite will fulfill its orbital mission in the circular low earth orbit. The designed active lifespan of the spacecraft is one year. The satellite’s mass is 65 kilograms. It is expected that MiR will be launched by a Rockot vehicle from the Plesetsk Cosmodrome. Due to the satellite’s mall dimensions it will be inserted into orbit as a hosted payload. To be launched with a Rockot around July 27, 2012. At the moment there are some problems with the Briz-KM Upper Stage of the Vehicle.